As Bob and I neared Indian Garden along Bright Angel Trail at Grand Canyon National Park, we kept a keen eye for birds and animals along the way so we could add pictures of new wildlife to our collection. 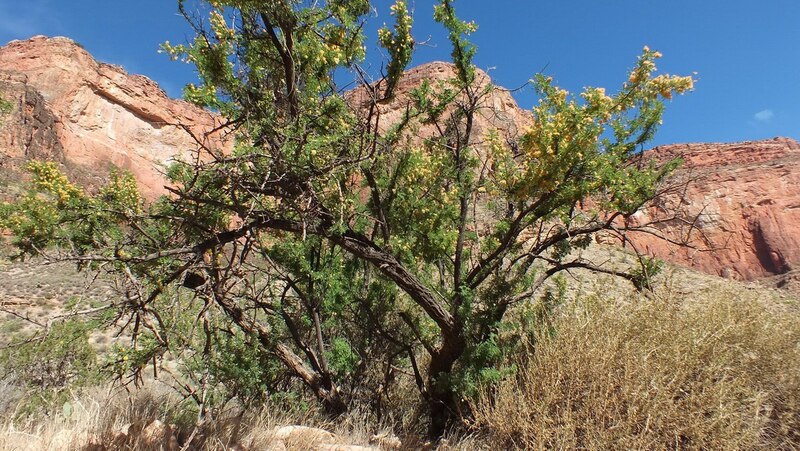 I was conscientiously watching for snakes and so tended to scrutinize the trail in front of me to avoid stepping on any, in particular any Grand Canyon Rattlesnakes that might be sunning themselves. 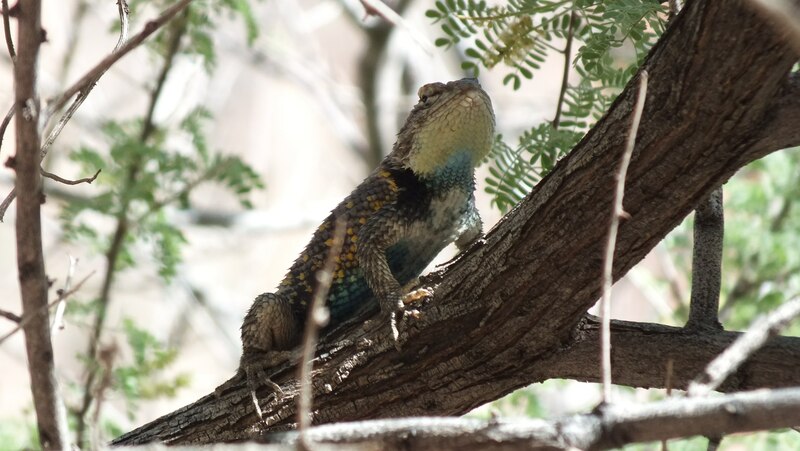 It was Bob who spied this Yellow-backed Spiny Lizard (Sceloporus uniformis) where it originally sat hunched on the small branch of a Catclaw Acacia (Acacia greggii). 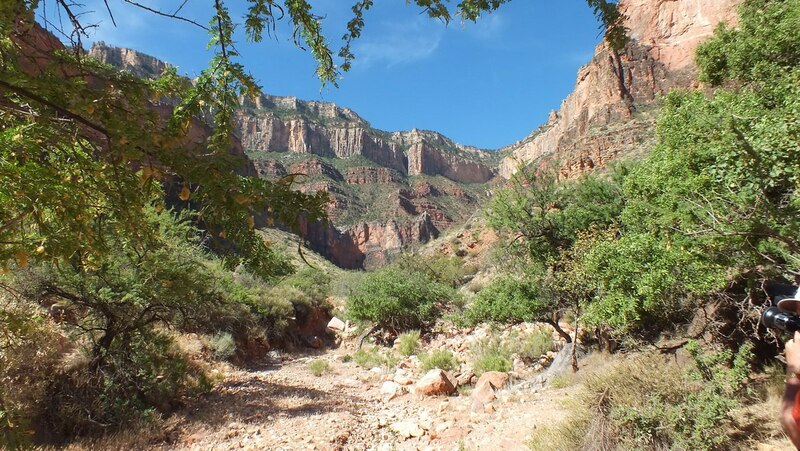 We had been hiking for over 4 hours at that point, descending into the canyon from the South Rim, so we were seeing vegetation that was remarkably different from that on the sheer cliffs and surrounding drier slopes. It was a precursor of the lush, green oasis that is Indian Garden. The intricacies of the Catclaw Acacia had me investigating the thorns and small oval leaves, but I did not detect the small creature just inches away. Lolling unobtrusively on one of the Acacia’s branches, tucked in behind the tiny leaves, was this well-camouflaged lizard. Its pale body matched very well the sun-bleached bark especially as the lizard remained stock still to avoid detection. 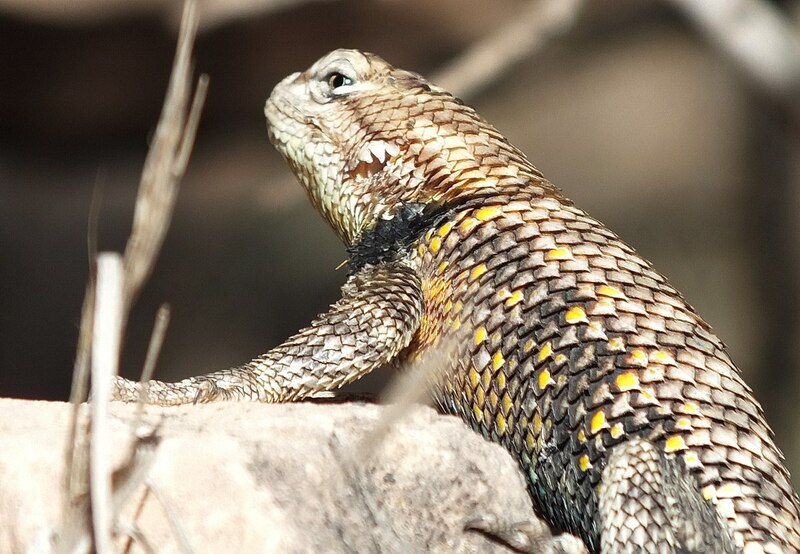 In addition to the predominant neutral shades of black and white, the lizard’s scales showed bright yellow scales randomly scattered about its sides, as well as vibrant turquoise scales along the sides of its belly and on its throat. It is those blue-green patches that identify this particular lizard as a male. 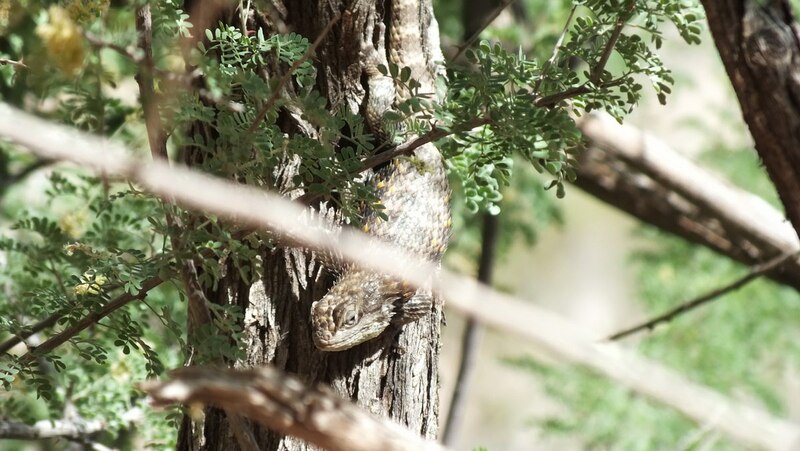 The lizard darted about the branches of the acacia bush, perhaps sensing our presence and interest in his movements. 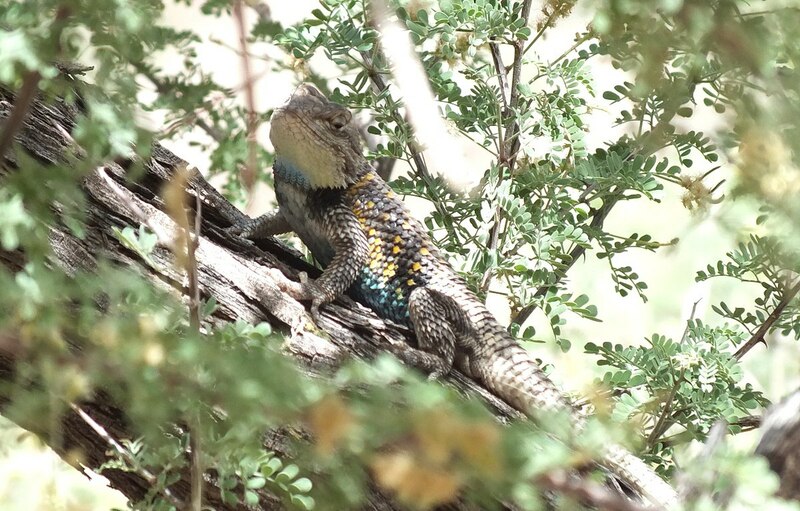 Yellow-backed Spiny Lizards are robust, stocky lizards that measure between 3.5-5.6 inches (8.9-14.2 cms) from snout to vent, which does not include the tail. The tail is longer than the head and body combined, and if it becomes detached, it will regrow. 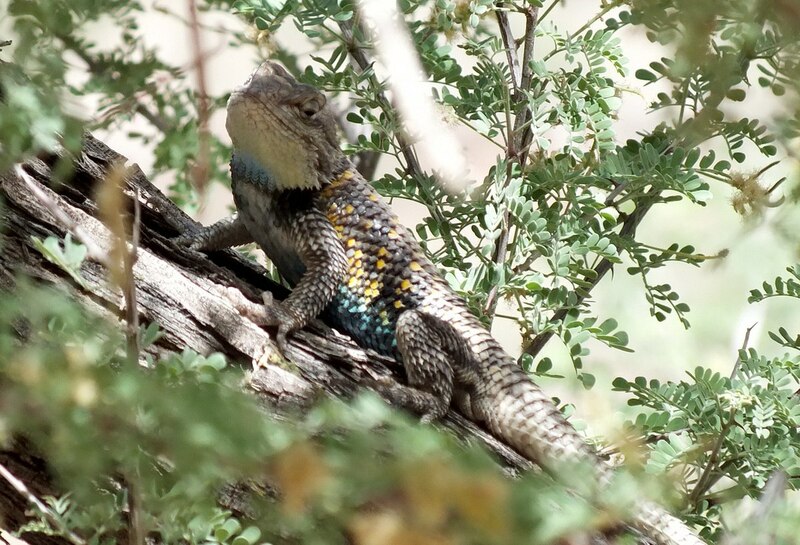 Yellow-backed Spiny Lizards are only active during daylight hours, and generally only between April and October. Even at that, they do take shelter on excessively hot days, when they will retreat into cracks and burrows under rocks or logs, or clamber up onto the branch of a shady tree. They are good climbers, and often give themselves away as they scratch and claw the tree bark when scrambling to the opposite side of a trunk or branch. 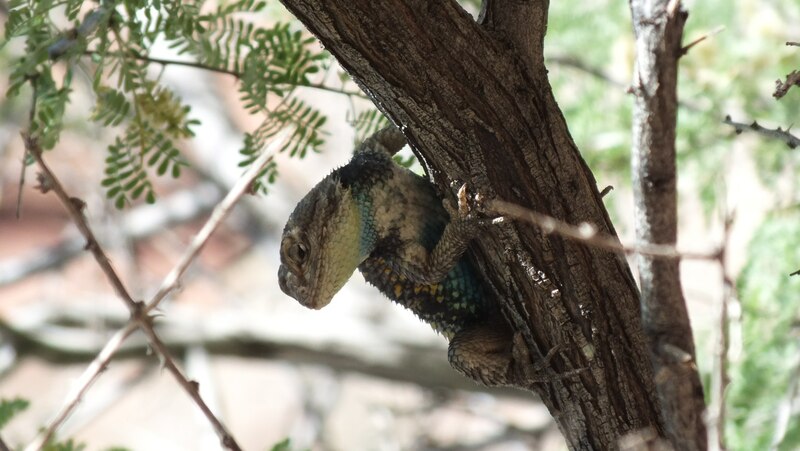 It was difficult to keep track of the lizard as it darted here and there among the many branches. Typically, they are a “sit and wait” predator, meaning that they don’t forage but rather wait for suitable prey to happen along. They eat a variety of insects, small invertebrates, spiders, caterpillars and even smaller lizards and newly-hatched birds. Perhaps we had disturbed the lizard from his predatory stance or simply left him feeling less secure in his cool retreat because he soon decided to move down onto the ground. 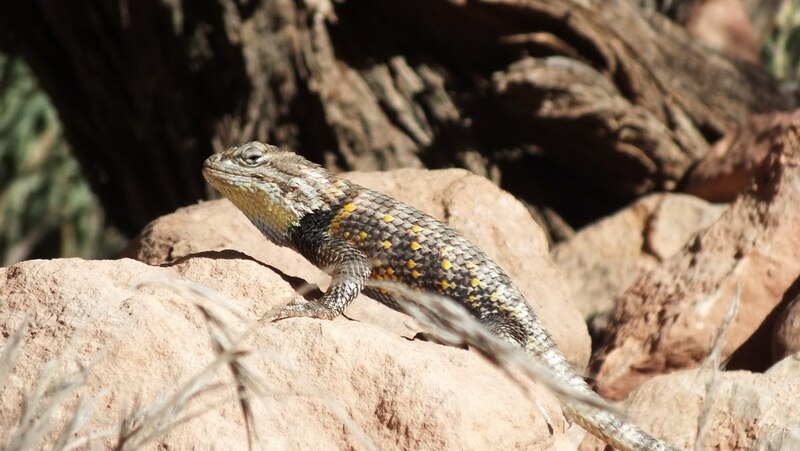 This species of lizard is very wary, and if feeling threatened, will disappear into the inner tangles of some creature’s burrow or nest or take cover under thick brush. Bob and I were thrilled when the lizard just pulled itself up onto a rock at the edge of the trail and surveyed its surroundings. It must have determined us to be of no threat. When there is a real threat of danger, males will stand tall, inflate the throat to expose the blue colouring, and pump the body up and down to ensure their presence is recognized and to advertise command of their territory. There, out in full sunlight, it was possible to distinguish the dark crossbars across its back. 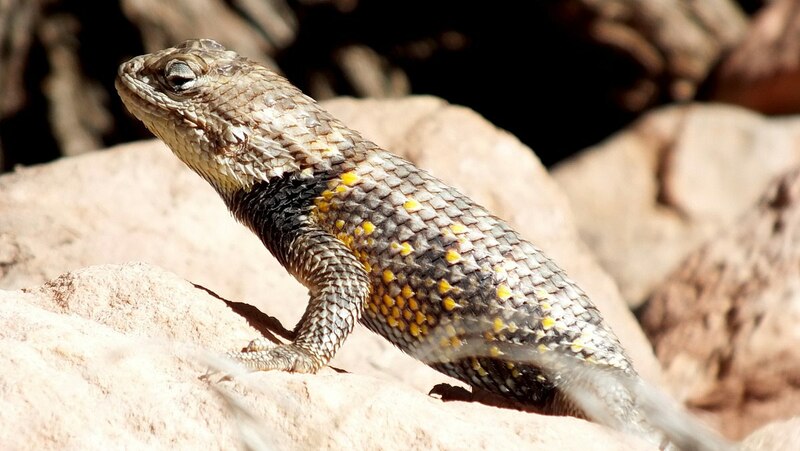 As its name implies, a Yellow-backed Spiny Lizard has large, pointed or spiny scales. Overall, their body coloration is grey, brown or tan with a distinct black wedge on the sides of the neck. These dark, triangular-shaped markings on the shoulders are absent on juveniles, so Bob and I concluded that this male must be an adult. With the lizard in full view, Bob and I became more aware of its large size. 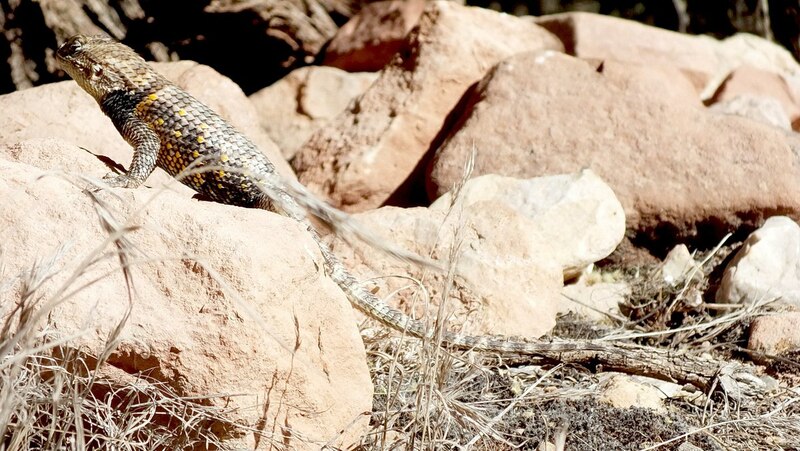 The tail trailed along behind its body blending in with the rocks and dry grasses. The lizard’s quick movements had me standing well back because these lizards can inflict a nasty bite but only if someone dares to catch one; they have strong jaws with which to chomp down on prey or a bold interloper. 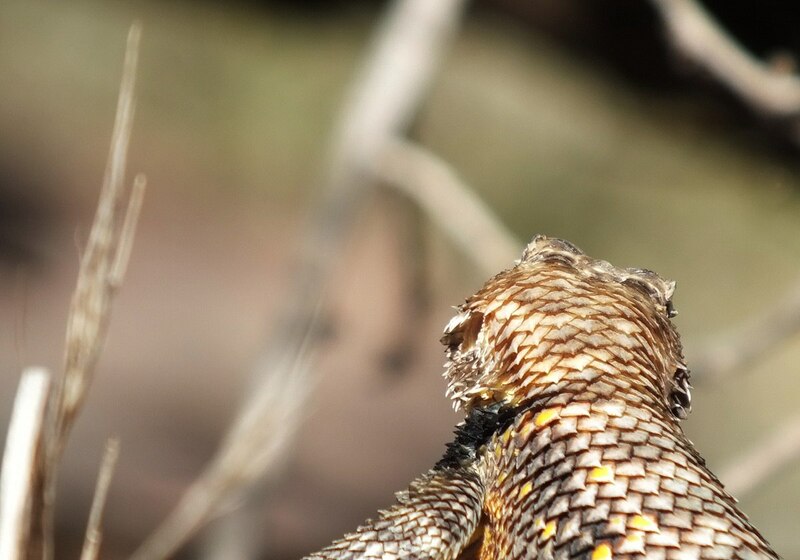 This photograph adequately shows the lizard’s ear openings which are partially covered with long, pointed scales. 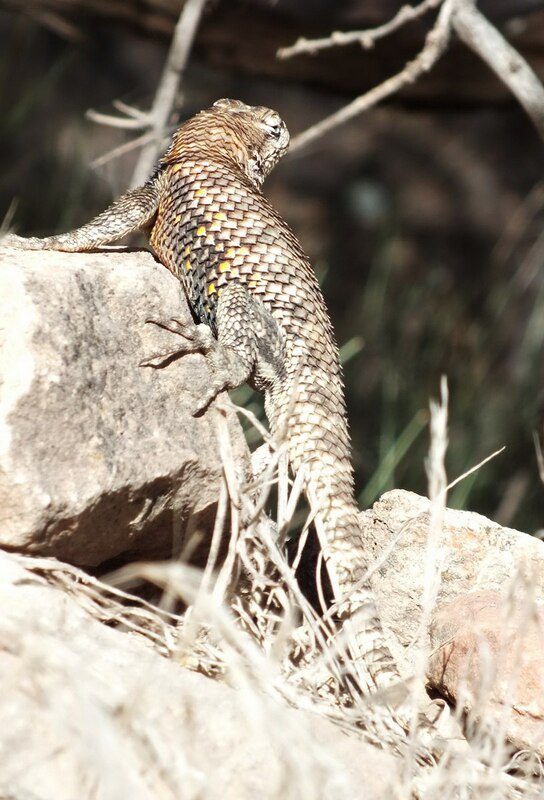 Yellow-backed Spiny Lizards are quite at home in arid to semi-arid habitats from sea level to an altitude of 6,000 feet (1,829 m). They inhabit a variety of landscapes including deserts, plains, mountain slopes and wooded riverbanks. Where we found the lizard was in close proximity to Indian Garden which is at an altitude of 3,800 feet (1,158m). Perhaps the nearby source of water makes the lizard’s life a little bit easier. Bob and I finally continued on our way towards the oasis ourselves. We needed to refill our water bottles, and it was time for our first lunch of the day.